The potential shift comes as US cities face increasing pressure from climate change, especially following a string of major natural disasters over the past two years. And it would coincide with a pullback in climate adaptation work by the Trump administration, which has reversed policies designed to prepare communities for global warming. Meanwhile, there is no clear roadmap, no precise model for many of the bigger crisis-fed decisions individuals and organizations are often forced to make in the absence of protocols and built-response systems of localities. A disaster comes along, and there’s no time to scratch heads and set up an exploration committee. It’s often said that the needs of many people are more important than the needs of just a few, but that does not provide comfort in the face of hard choices; it just adds another piece to the weight of deciding who loses in the race to hold back a wall of water. A storm called a “bomb cyclone” hit the Midwest on March 15th, with pouring rain falling on frozen, snow-covered ground. 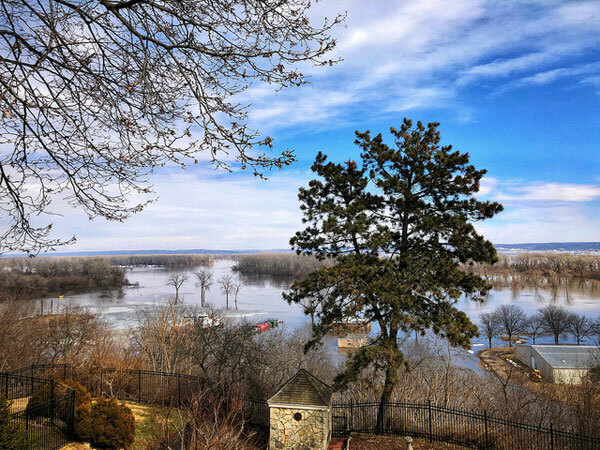 The rain and runoff flooded parts of Missouri, Iowa, Kansas, and Nebraska, raising the level of Little Sioux River 16 feet in 24 hours and covering a third of the Offutt US Air Force Base near Omaha. Winds blew at hurricane strength, gusting over 100 mph in places. Colorado registered its lowest barometric pressure in history. The Spencer Dam gave way to the Niobrara River, a tributary of the Missouri, which flows through Wyoming and Nebraska. The Gavins Point Dam in South Dakota began to strain as the reservoir it contains filled. John Remus, the chief of the Army Corps of Engineers’ Missouri River Basin Water Management Division, is the one who manages the six major dams along 2,000 miles of waterways, most of which were built before concerns of climate change. After the Dust Bowl era in the 1930s and subsequent flooding, Congress determined that dams would solve the problems. Included in land that was submerged by new dams was 350,000 acres belonged to Native Americans. The Yankton Sioux, who did not provide consent, were paid $23 million for 2,851 acres in 2002 for the taking of their land, with some acres still in contention. The country got hydroelectric power and cheap farmland. Those dams have aged considerably since. Here was the decision Remus faced: Should he take the risk that Gavins Point, a major dam not designed for such conditions, would hold the Missouri River at flood stage? Or, instead, should he open the spillway to ease the pressure—flooding homes, farmland, and towns? “It’s human nature to think we are masters of our environment, the lords of creation,” Remus says. But, as he said, there are limits, and the storm last week that caused him so much trouble was beyond what his network of dams could control. Remus ordered the spillways open, and 100,000 cubic feet of water per second poured through. The speed of the water matched that of Niagara Falls. When the bomb cyclone was doing its damage and topping levees, the sheriff in Bartlett, Iowa, decided to order an evacuation. Homeowner David Lueth ignored the order, though he knew river water was coming. He had lived through a flood and a levee failure in 2011 and spent his life savings to restore his land. After that storm eight years ago, Remus tried to convince the local board to move the levees. They were unwilling to spend the massive amount of money it would take for complete replacement and just shifted the levees back a bit. Following the 2011 storm, the Corps was accused of placing a higher priority on wildlife than controlling flooding. A federal judge agreed last year. Lueth has gone from sadness to anger, questioning the effort to save Garvins Point Dam while sacrificing those downstream. Lueth’s house was a victim of the flooding this month. And new crisis decisions may be on the horizon for Remus; spring rains are right around the corner.